I’m not just talking about Romney’s apparent support for mothballing FEMA and devolving its functions to states or private contractors. This struck me as a pretty clear primary-campaign pander, though Romney should still own every bit of it. I’m talking more about Romney’s personal philosophy of private initiative versus public responsibility, as epitomized by his own record of paying taxes and charitable giving. Romney, you’ll recall, frequently sends less than 15 percent per year to the U.S. Treasury, despite an annual income in the tens of millions of dollars and a net worth in the hundreds of millions. Much of this is accomplished through a rather aggressive use of tax loopholes, some of which we know about and many more of which we presumably don’t. When pressed on this generally legal but unseemly exercise, Team Romney often emphasizes that, combined with his large (and commendable) charitable contributions, Romney is in the habit of forking over heaping portions of his income to other entities. For example, the campaign noted in a recent release that, for 20 years starting in 1990, Romney’s “total federal and state taxes owed plus the total charitable donations deducted represented 38.49% of total [adjusted gross income].” In 2010, Romney only paid an effective federal tax rate of 13.9 percent but gave another 13.8 percent to charity. In 2011, the figures were 14.1 percent in federal taxes and 29 percent to charity. 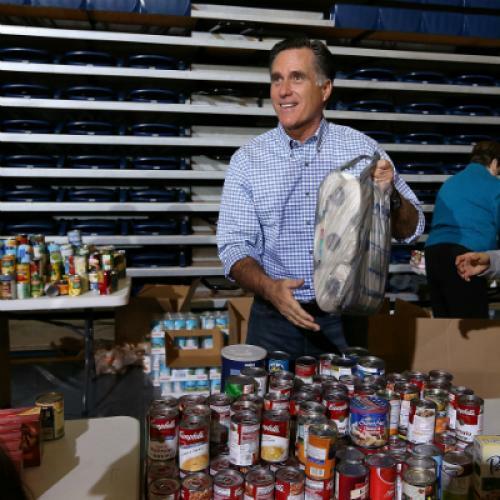 The most logical (and, um, charitable) upshot of all this is that Romney really does believe aiding those in need is best accomplished by individuals and private charities, not the federal government. It’s an especially appealing proposition for a Mormon, a community with a remarkable history of caring for its own, especially when the government either neglected or actively persecuted it. As Stephanie Mencimer recounts in a fascinating post at Mother Jones, the Church’s Bishop’s Storehouse Services became famous for the efficiency with which it distributed aid during the Great Depression, and Utah residents routinely respond to the state’s natural disasters with breathtaking coordination. In 2005, the Church showed up the federal government by almost seamlessly evacuating nearly 2,500 Mormons from New Orleans before Katrina struck. The problem, as Mencimer goes on to point out, is that the model simply doesn’t scale. You can deal with 2,500 people using private resources, or the occasional flood in Utah, but you can’t possibly manage a Sandy-like calamity. The magnitude of the disaster is simply too large—the amount of coordination required is too unwieldy, and the pot of money needed to rebuild overwhelms even the largest private organizations (at least if you have a major disaster more than every few years). It’s no surprise that Utah’s Republican governor Gary Herbert is a serial requester of disaster funds, according to Mencimer. There are a lot of people who [are] still going to be looking for goods even if we gathered these things. But one of the things I’ve learned in life is you make the difference you can. You can’t always solve the problems yourself, but you can make the difference in the life of one or two people. It’s not hard to believe that someone so taken with the power of charity, even during a huge crisis, would be open to the block-granting and outsourcing a GOP Congress will surely work into the budgets it sends him.